1. Pre-heat oven to 160°C and line the baking tins with baking parchment. 2. In a bowl, beat the sugar and softened butter together. 4. Add in all the dry ingredients and beat on a low speed, then add in the lemon rind of 1 lemon, and then the juice of 2 lemons. Add in the vanilla essence and beat in well. 5. Add in the yoghurt and beat until the mixture is a pale yellow colour. 6. Divide the mixture into 2 baking tins. 7. Bake for 20-25 mins. Check that the cake is done by using the cake tester. 9. Make the buttercream filling. Beat all the ingredients together with spoon to form a paste. You could always make more buttercream if you like, or make a jam filling if you wanted. 1. For the green to cover the cake you can use green icing or green colourant mixed with the white. Using a rolling pin, roll out the icing so that it fits the cakes measurements. 2. Gently place the green icing over the cake, and use the back of a knife to smooth it around. 3. To make the bunny, roll out the white icing and form into a ball for the body, then make the feet and so on. For the flowers, you can really go to town if you have shape cutters, or you can create them yourself. 4. For the soil, in a pan, bring water to the boil, and melt some butter the chocolate together in the bowl along with the gluten free cocoa rice. Mix together. Once cool, add to the top of the cake. 5. Arrange the carrots in the soil and place some gluten free chocolate eggs or buttons at the bottom or the top of the cake. Pre-heat oven to 160°C and line the baking tins with baking parchment. In a bowl, beat the sugar and softened butter together. Add in all the dry ingredients and beat on a low speed, then add in the lemon rind of 1 lemon, and then the juice of 2 lemons. Add in the vanilla essence and beat in well. Add in the yoghurt and beat until the mixture is a pale yellow colour. Divide the mixture into 2 baking tins. Bake for 20-25 mins. Check that the cake is done by using the cake tester. Make the buttercream filling. Beat all the ingredients together with spoon to form a paste. You could always make more buttercream if you like, or make a jam filling if you wanted. For the green to cover the cake you can use green icing or green colourant mixed with the white. Using a rolling pin, roll out the icing so that it fits the cakes measurements. Gently place the green icing over the cake, and use the back of a knife to smooth it around. To make the bunny, roll out the white icing and form into a ball for the body, then make the feet and so on. For the flowers, you can really go to town if you have shape cutters, or you can create them yourself. For the soil, in a pan, bring water to the boil, and melt some butter the chocolate together in the bowl along with the gluten free cocoa rice. Mix together. Once cool, add to the top of the cake. 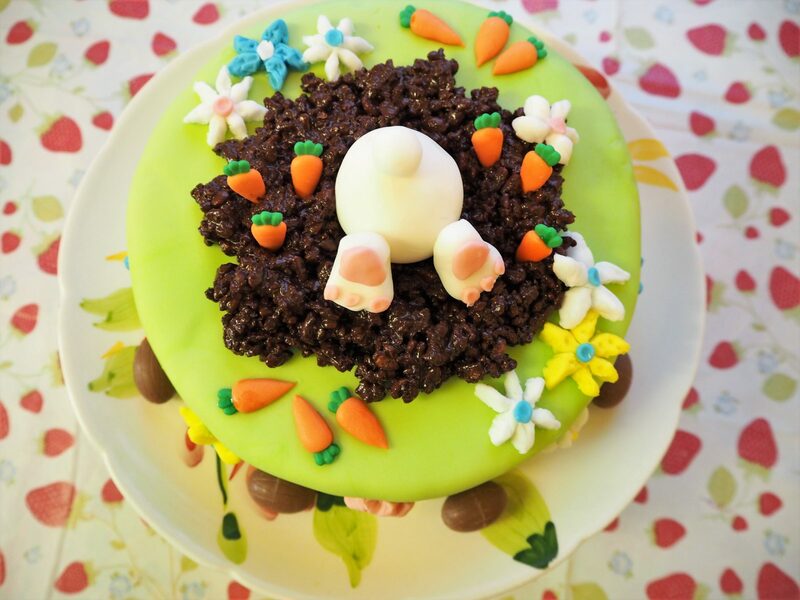 Arrange the carrots in the soil and place some gluten free chocolate eggs or buttons at the bottom or the top of the cake.